The UP200 Sled Dog Race, one of the top annual sled dog races in the lower 48 and a qualifier for the famed Iditarod race in Alaska. We'd previously been to the Minnesota's John Beagrease sled dog race and the Apostle Islands Dog Sled race and have wanted to catch the UP race for several years, but things always came up to change our plans. 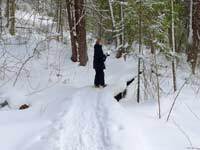 So in 2012 we finally made it . . . .
See More Marquette Winter Events and Munising Winter Skiing and Snowshoeing. Well almost. The morning of the race while traveling west of Munising returning from snowshoeing, nasty noises began eminating from the left front wheel of our truck. Investigation led us to conclude a wheel bearing was starting to go out. Since our plans involved chasing around the remote countryside between Marquette and Grand Marais to follow the race, we feared we might break down in some isolated place, risking life and limb in freezing weather. We also figured we'd be greeted with an expensive and a long delay waiting for repairs. So reluctantly we decided we'd better head directly home to Wisconsin before the bearing failed completely. So the pictures and videos here are courtesy of others who were lucky enough to attend the race and festivities associated with the race. For us it is better luck next year. The following video from Under the Radar - Michigan provides a super introduction to the sport of Sled Dog Racing as well as some great pre-race scenes in Marquette and the ceremonial start of the race in downtown Marquette. Here's another video showing a close-up of a sled dog team on the trail. In YouTube you catch several other interesting race videos. Ryan Anderson won the main race - the 240 mile UP200. This was his third victory in this race. David Gill from Skandia, Michigan took second place and third place went to Martin Koenig of Seeley Lake, Montana. 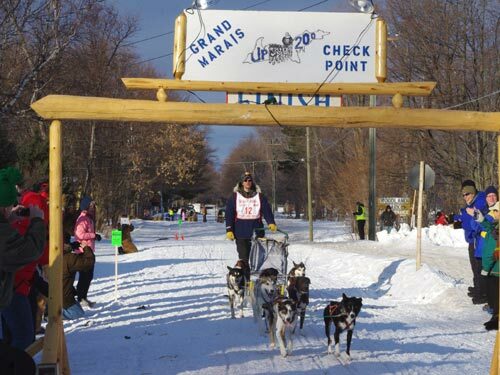 Joanna Oberg from Ignace, Ontario, Canada won the Midnight Run, a 90 mile eight dog race that begins Friday evening in Marquette and finishes the next morning in Munising. Allena Baum, from Kennan, Wisconsin, won the Jack Pine 30, a 30 mile six dog race that runs from Gwinn to Marquette. The Jack Pine is favored by younger and first time competitors. See more race results and photos at the UP200 Website.